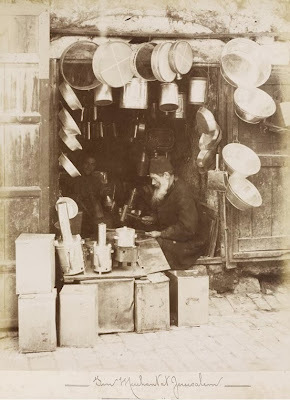 Original caption: "A Bazaar in Jerusalem"
In his 1871 travelogue, Travels around the World, former U.S. Secretary of State William Seward described the prayers of the Jews at the Western Wall (Kotel) -- "pouring out their lamentations over the fall of their beloved city." He reported the Jewish population of the city was 8,000, twice the number of the Christian or Muslim residents. 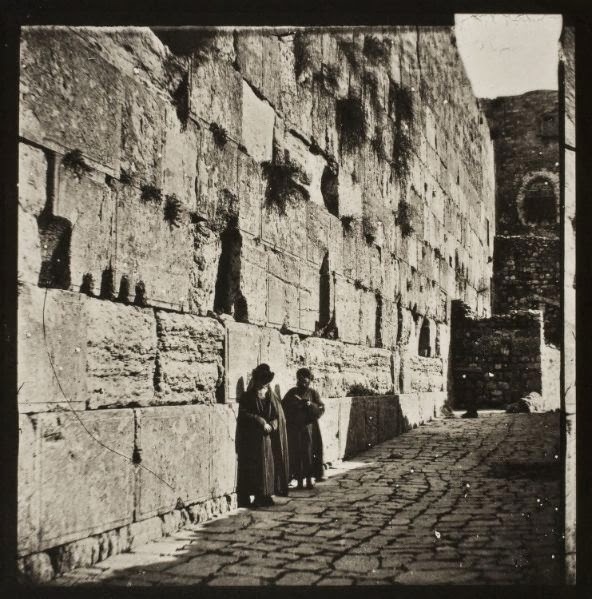 Many of the century-old photos of the Jews of the Holy Land were taken during their prayers at the Kotel. 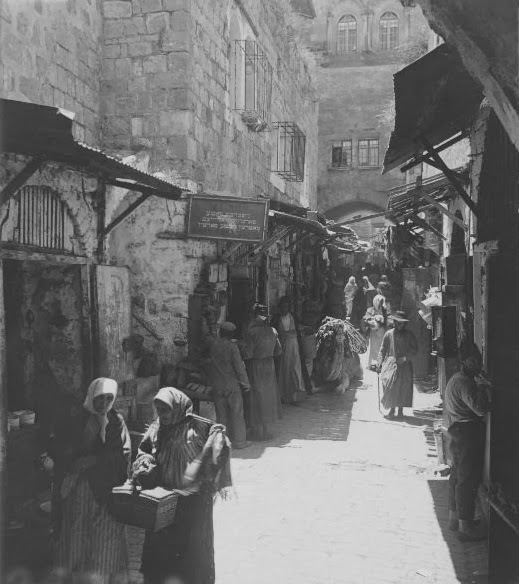 Far fewer were the less formal pictures of their everyday life in Jerusalem. We present such pictures here. What did everyday life look like? Close scrutiny of the "Bazaar in Jerusalem" shows Jewish men (and probably Jewish women in the foreground) shopping and walking past a parked camel in the shuk of the Old City. See the enlargement below. The sign. Interpretations are welcomed. 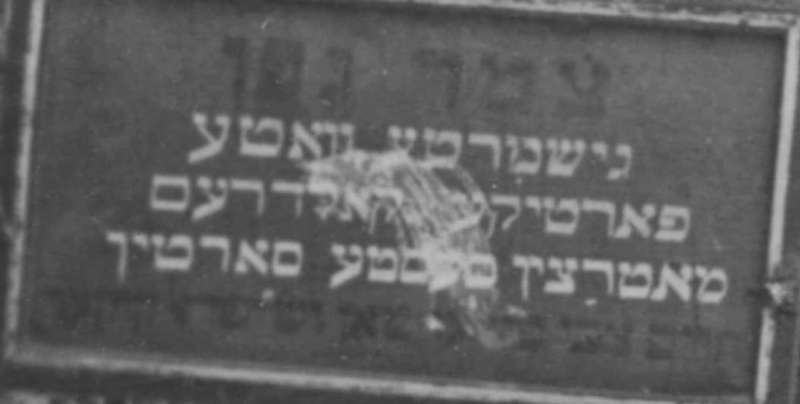 The last line are the names of the store's proprietors, but all that can be easily read is "Chaim Tzvi." Rabbi Kook's kashrut supervision) and a printer. "Jeblanier jeuf à Jérusalem," taken in 1890. 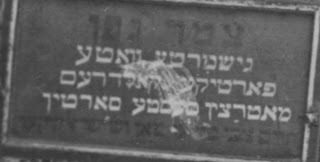 The Jewish merchant's profession is a "ferbantier"
picture is from an enlargement of an original - here. enlargement of an original - here. 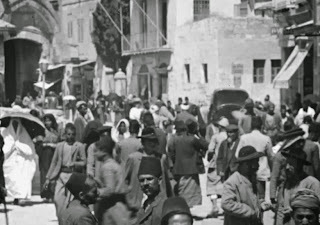 The setting inside the Jaffa Gate would again appear in later pictures showing the evacuation of Jews from the Old City during Arab rioting in 1929 and 1936. (Note the tree in the pictures above and below.) In 1948, the Old City Jews were expelled through the Zion Gate. 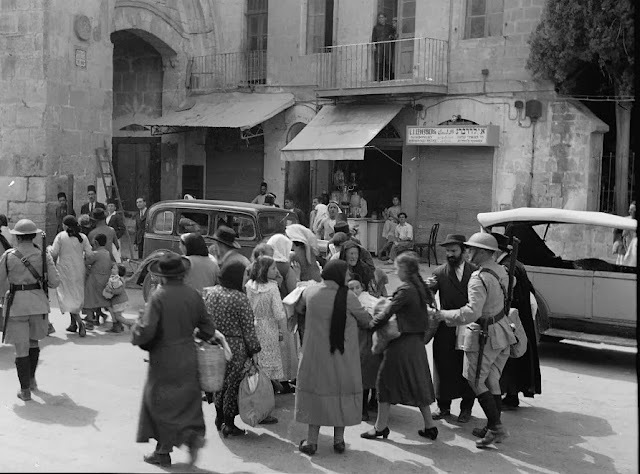 Jewish evacuation from the Old City of Jerusalem, Jaffa Gate, during 1936 Arab rioting and attacks. Click on pictures to enlarge. Click on captions to view the original pictures.